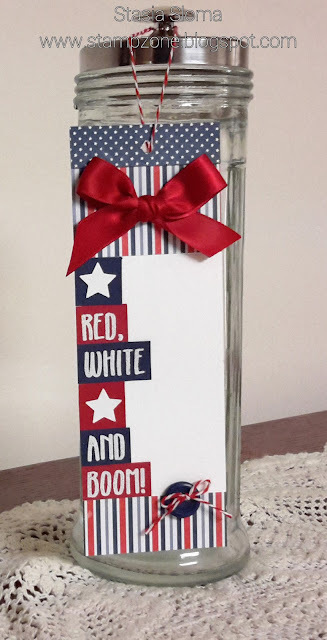 So a little fun for you this Memorial Day, here is the fun sentiment from the Red, White and Boom stamp set from The Project Bin. I pulled it out to make a cute little tag to put on gift package of goodies when bringing a little something to your memorial day festivities. The sentiment was heat embossed on red and navy card stock and then I cut it up to put on this tag vertically. I added some white stars on top of red and blue card stock. American Pebbles designer paper was added along with a button, twine and satin ribbon to finish the tag.